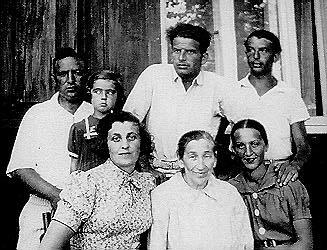 Standing from right:Yitzhak Hilelson, Gershon Hilelson, Leah'le, her father Yehuda Goldberg. 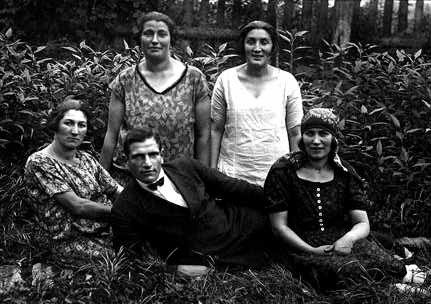 Sitting from the right: Yitzhaks first wife (name unknown), Mina Rosin Hilelson, Elka Hilelson Goldberg (Leah'le's mother). Mina Rosin Hilelson was the aunt of Joseph Rosin, mother of Yitzhak, Gershon and Elka and grandmother of Leah'le. The small town of Sudarg is situated in the south-western part of Lithuania, in the county of Shaki (Sakiai), on the left bank of the river Neman (Nemunas) and close to the border with East-Prussia. It lies 9 kilometers (5.4 miles) down-river from the larger town of Jurbarkas (Yurburg or Yurbrik in Yiddish) which lies on the right bank of the Neman river and can be found on many maps (click here to see a map, then click on "BACK" button to return to this page). The town was established during the second half of the sixteenth century, and in 1724 King August the Second granted the town its city rights. During the third division of Poland in 1795 the territories on the left bank of the river Neman were given to Prussia and during that period (1795-1807) the above mentioned rights were annulled. From 1807 until 1815 Sudarg was within the boundaries of "The Great Dukedom of Warsaw". At that time people used to say that "when a rooster crowed in Sudarg he was heard in three countries: Poland, Russia and Prussia." After the defeat of Napoleon, Russia took over all the territory of Lithuania and ruled there from 1815 until the First World War. During these years Sudarg was a small town with an growing population: In 1827 there were 373 inhabitants in the town, in 1890 - 900 people and by 1901 about 3,000. The first Jews probably settled in Sudarg at the end of the eighteenth or at the beginning of the nineteenth century. At that time community institutions were established and for many years the Jews were the majority. In 1856 Sudarg had a population of 689 people, of whom 627 were Jews (91%). A large forest of about 1,000 hectares (an area of 2 miles by 2 miles) near Sudarg, lying partly in Lithuania and partly in Prussia, was a convenient site for smuggling and many Jews made their living from this activity. There were some people from Sudarg, also including Jews, who would float timber down the Neman river; in Sudarg these rafts of timber would be disassembled, the logs would be sawed up and loaded onto boats for transportation to Germany. In those days, Sudarg's connection to the world was by way of boats on the Neman River or by carts in summer and sledges in winter. In spring, when the ice on the Neman began to break up and the dust roads were full of sludge and mud, the town was practically isolated from the world. During the period of Independent Lithuania (1918-1940), Sudarg became a forgotten small town, where opportunities to earn a living became ever more difficult. As a result almost all Jewish youths left the town and moved mainly to Kovno (Kaunas) or went abroad and the Jewish population of Sudarg dwindled. The first census in Sudarg undertaken by the Lithuanian government in 1923 showed only 257 people in the town. During the years before World War I and in the first years of Lithuanian rule many young people from Sudarg emigrated to America (to El Paso and Dallas, Texas and Albuquerque and other parts of New Mexico, and New York City to name a few places) and there raised large families (Rosin-Rosen, Hilelson-Hilson, Guttman, Goodman and others). According to Martin Miller, Joseph Hillel Goodman (Guttman) from Sudarg helped 47 of his fellow townsmen immigrate to El Paso, Texas in the early part of this century (see below for more information from Martin Miller). The Jews in Sudarg ran a few grocery and haberdashery stores, two taverns, two bakeries, a pharmacy and a wool combing workshop. Others traded illegally in meat, mainly with the Germans on the other side of the border. According to the Jewish Craftsmen Association's survey of 1937 there were then two Jewish tailors, one butcher and one baker in Sudarg. Throughout the whole period of the presence of a Jewish community in Sudarg, there existed a great synagogue (Di Shul), decorated inside with spectacular wood engravings. This synagogue was used for prayers only in summer, while in winter people would pray in the other synagogue, the "Beth-Midrash," in which there was a stove. Both synagogues were built in the nineteenth century and were made of wood. Among the Rabbis who served in Sudarg were: Tzvi Rom (1844-1886), author of the book "Eretz Hatzvi" (Land of the Deer); Sender Vilensky; and also Regensberg who moved to New York in the 1920s in order to serve there as a Rabbi. In the 1930s J. Cohen served as Rabbi in Sudarg. In the 1920s there still was a "Heder" in Sudarg, where children learned to read and write, also study some biblical scriptures and a little Hebrew. Later the few Jewish children studied in the Lithuanian school. The engineer and architect Moshe Yitzhak Bloch (1893-August, 1942), a native of Sudarg, devoted much of his time to drawing up city plans. He even prepared a plan for excavating a channel from Haifa to the Jordan river, exploiting the difference in height between the Mediterranean and the much lower level of the Jordan in order to produce electric energy. He also had plans for irrigating the Negev. The British mandatory authorities found his plans interesting, and in 1938 he visited London in order to discuss these with them, but was told that Europe was on the verge of war and that this was not the right time to deal with such plans. He taught painting and drawing in two Hebrew High Schools in Kovno. On the 14th of June 1941 he was arrested by the Russians and sent to a labour camp in the Archangelsk region as a "counter revolutionary", being the chairman of the "Revisionist" (Hatzohar) party in Kovno. He was shot by a guard in August 1942 when he demanded that they stop humiliating prisoners. The municipality of Be'er Sheva on Israel named a street after Engineer Yitzhak Bloch. The German Army had already entered Sudarg on the fi rst day of the war between Germany and the Soviet Union, on the 22nd of June 1941. During the first days after their arrival, the Germans and their Lithuanian collaborators started to plot against the local Jews, which at that time consisted of only about 30 Jewish families. In the beginning of July 1941 the Nazi and their Lithuanian collaborators transferred all men as well as two intelligent young women to Shaki, where they were murdered, together with the local men on the 5th of July 1941 (10th of Tamuz 5701). The women of Sudarg had sent a Lithuanian peasant to clarify what had happened to their men. The peasant arrived in Shaki just at the time of the murders and was an eye witness to the horror, and on his return to Sudarg he lost his mind. The women and children of Sudarg were murdered on the 6th of July 1941 (11th of Tamuz 5701) in the vicinity of the village of Kidul. Visit the Shtetlinks site of Yurburg, Lithuania, the closest larger shtetl, which was quite connected to Sudarg (much commerce and many marriages). "The first family that I know of that lived in Sudargas for sure were the Bloch family that settled in Syracuse, NY; Scranton, PA; and Bayonne, NJ. Some also went to various points in Nebraska, Texas and finally to California. The Berkman family likewise lived in Syracuse, NY and also in Johannesburg, South Africa. There was also a branch that lived in Rochester, NY, and some in Israel. The Rothschild family also lived in Syracuse, NY. Sarah Rothschild married Joseph Hillel Goodman in Syracuse in 1895 and went with him to El Paso. One of her brothers died in Springfield, MA. Another sister married and lived in Streeter, IL. That branch of the family lived in Sweden for a time, where one of her brothers was born." Connect to the Home Page of Martin Miller who has researched family from Sudarg for that information. .... I don't know when the community actually started. I know there were some German Jews there earlier than my family. The first of nine Goodman's to arrive there was 1882-83. The last was in 1910. My dad was I believe the fifth-in 1898. Dad's older brother Joseph became a one man immigration service, and over the years he imported 57 members of the family. So we had a lot of relatives. One sister, Chana Guttmann Bendalin stayed in the Sudargas, Lithuania area and she died in the Holocaust. Six of her 7 children ended up in El Paso, They were my first cousins. Two are still living. All together in my generation of the Goodman family there were 36 children. Ten are now left; one (Anne Goodman Gollob) died last week at the age of 92 years and 10 months. Of the 10 still living the eldest is Ruth Goodman Carr (Anne's older sister) who will be 97 in September, and the youngest is my sister who is 79. I never tried to count all the El Pasoans who were connected to the Goodman family over the generations, but I believe 200 is a fairly good guess. A book was written about influential Jews in the state of Texas, and there you will find a write-up about Uncle Joe-actual name Joseph Hillel Goodman. If we go back to about 1816 we find that Sudargas was the source of a very large group of the Guttmann family. My great grandfather, Kofe Guttman, was, to our knowledge, the father of 12 to 14 children. A large group lives in Mexico City, and it is here that the paths of members Joel Alpert's family and the Guttman family cross. Or marry!! My mother's family also is tied to Texas. Mother was born in San Antonio in 1886. But her roots are in the Ukraine, Kiev to be specific. Do you have roots in Sudarg (Sudargas)? Would you like to connect with others researching the same community? Then click the JGFF button below to search the JewishGen Family Finder database. Click here to learn more about the JGFF and its use. Also it is a good idea to register on the JewishGen Family Finder (JGFF).